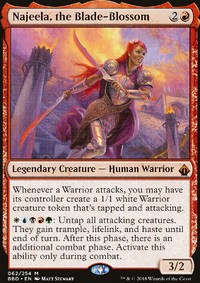 Whenever Blaring Captain attacks, attacking Warriors get +1/+1 until end of turn. I see you have Derevi, Empyrial Tactician in your maybe board. You should definitely move him to the main board. His value is ridiculously strong. 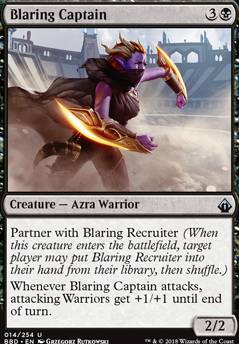 Other cards I would recommend that won't necessarily break the bank: Bear Umbra, Kindred Discovery , Reconnaissance, Shared Animosity, Path to Exile, Cyclonic Rift, Yasova Dragonclaw, Eternal Witness, Vandalblast, Shattering Spree, and By Force. Reconnaissance is truly an all star. It allows you to swing with everything, then remove them from combat AFTER their damage goes through but BEFORE your opponents damage goes through. It's like vigilance, only 10x better. Plus allows you to tap them for mana to things like Cryptolith Rite. One sided board wipes, clears, or artifact removal, or even just spot removal is always a good thing. Though it might more depend on the meta you play in, the need for those cards. Eternal Witness can get you your cards back. 'Nuff said? Yasova Dragonclaw can steal some fun things. Shared Animosity can get ridiculous, real quick. It's like a cheaper Coat of Arms (but slightly worse, but only goes for your things...so...you know). Kindred Discovery is a great card draw engine. And lastly Bear Umbra. Use your mana to cast. Attack. Use your mana to take infinite combats. It's like Sword of Feast and Famine, except it does less and costs significantly less $$$$$. Now the hard part. What do you cut to put things in that maybe help you combo, or make your stuff bigger, all of a sudden, or just to provide value? My recommendations for that, mostly based on high CMC or not providing as much value as something else: Zealous Conscripts, Surrak Dragonclaw, Stonehoof Chieftain, Lovisa Coldeyes, Jazal Goldmane, Blood-Chin Fanatic, Blaring Recruiter, and Blaring Captain. Of course, all of these are just suggestions. If you like the way a card interacts with the deck, or you think it's just fun to play, keep it! It's just a game, designed for people to have fun with. And all that matters is that you have fun with playing your deck. Best of luck to you in all your future games, I love Najeela. She's a lot of fun, and almost no one like to see her across the table from them. Interesting idea. Definitely all over the place except for the focus on creatures. My suggested theme is mana, many of these are middling and up on CMC. Anything that works with ETBs is good too. Aura Shards, Impact Tremors, and Warstorm Surge for instance. 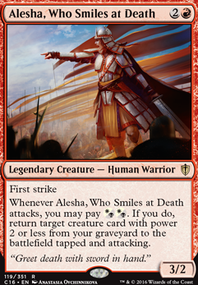 For commanders consider Najeela, the Blade-Blossom. 8 of these are warriors and 2 produce warriors, Regna, the Redeemer and Blaring Recruiter. 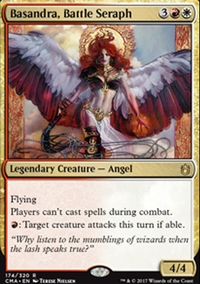 You can also use the potential for extra combats since some of these are aggressive and love attacking like Blaring Captain, Impetuous Protege, Okaun, Eye of Chaos, Soulblade Corrupter, and Virtus the Veiled.